about 1 hour ago the partridge family bus images started going through my head I guess that is sort of inevitable for people of my era. looking at something with bright colors with black boarder. These are actually much brighter in person than they are in this photo but that is how it goes. This isn't the final layout of these pieces as they will have triangles of fabric in them. I have been annoyed in the past when I have looked at other coats from other plays that do not actually have all the colors of the two songs in it. I also have yet to see one with a golden lining either so I am trying to be true to the song. I will also be piecing the sleeves and the bodice of the coat. Nothing like sewing with out patterns that is how all this play is being done . I draft the patterns as I go in my head and start cutting and sewing. A lot of the fabrics in this have come from costumes and clothes that I have made for my own children and are scrapes of fabric from my vova so it is very sentimental to me. 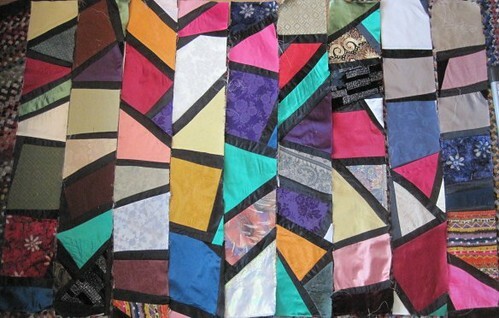 I had been saving the fabric to make a crazy quilt someday. I have not used up all of any one fabric so I can still do that in the future. You have given yourself a project there. Tell me do you have a gols lining for it?